Photo by "Patricia VH":http://www.flickr.com/people/ton3vita/ via Flickr. From time to time, I’ll give an overview of one broad MediaShift topic, annotated with online resources and plenty of tips. The idea is to help you understand the topic, learn the jargon, and take action. I’ve already covered blogging, citizen journalism, political polling sites and other topics. This week I’ll look at alternative business models for newspapers. It’s easy to see the problems plaguing the business of daily newspapers in America. The Tribune Co. filed for Chapter 11 bankruptcy. The Christian Science Monitor said it would publish weekly in print instead of daily. Detroit newspapers announced they would be cutting home delivery to three days per week. Layoffs are rampant and newspaper company stocks are down in the dumps. A successful online newspaper will need a mix of many different revenue streams to survive in the digital age." What’s difficult is finding solutions to these business problems. With this in mind, MediaShift presents this guide to alternative business models for newspapers . The models we profile range from those that newspapers have been experimenting with for a while, to those that are brand new, or recently borrowed from other types of media. Our goal is to help spread the word about some of the best ideas and experiments in the industry. Most likely, there won’t be a “silver bullet,” an idea that will catch on as the savior for the newspaper business. Instead, a successful online newspaper will need a mix of many different revenue streams to survive in the digital age. Blog networks aggregate blogs written by staffers, freelancers and readers. These blogs generate more page views that can be monetized with targeted ads, especially if the blogs are focused on specific topics like sports, health or politics. The Washington Post even started its own custom blog network called Blogroll, which offered to help run ad sales for outside blogs and promote them on the washingtonpost.com site. But Washington Post stopped adding blogs to its program due to lack of revenue. Prognosis: Having in-house blogs seems to be a better strategy so far than aggregating or selling ads on outside blogs. LATimes.com jumped up to the No. 2 newspaper site in terms of traffic last month, and its blogs helped it drive more traffic, leading, perhaps to more ad inventory. One of the big reasons newspapers are hurting is that their classified ad business has been usurped by online upstarts such as Craigslist, which offers mainly free ads. Newspapers have tried to offer extras online, including print/online specials for people buying classifieds. They have also invested in online sites such as CareerBuilder.com (owned by Gannett, Tribune, McClatchy and Microsoft) or partnered with classified providers such as Oodle or Yahoo HotJobs. Prognosis: It’s hard to imagine newspapers catching up to Craigslist and other free options online just by partnering with outside firms. They will need to super-charge listings and add extras galore — some they can charge for — in order to entice people back. Prognosis: Too early to say what will happen. Crowdfunding could help freelance reporters in specific areas, but it might not translate well to a newspaper culture. Print is far from dead. Many newspapers can use technology to offer up customized print pages — with ads — for readers, or hyper-local editions of their papers. A Brazilian paper recently let readers design their own front page, which was then custom printed with the paper and delivered to them — sponsored by Nissan. The new Printcasting project at the Bakersfield Californian lets publishers create their own custom publications with ads that subscribers can then print out at home or read as PDFs. Prognosis: Many people still prefer to read news in print, so these stopgap measures could help the transition to new digital platforms. Home printing could work, but color ink costs can be high. Many newspapers have tried to set up special hyper-local editions online, targeting smaller neighborhoods and letting citizens post stories, photos and videos of life there. The business case was that user-generated content was cheaper to produce, and that small businesses would flock to reach those people. But so far, the most successful hyper-local efforts have been reverse-published print editions at Northwest Voice in Bakersfield, Calif., and Your Hub in Denver, where the best online content is printed in special editions with print ads. Washingtonpost.com’s LoudonExtra was touted as another innovator, but ended up falling short because staffers didn’t interact with the community enough, according to media analysts who talked to the Wall Street Journal. Prognosis: This has been a hit-or-miss proposition for newspapers. The most successful efforts have put staffers out into neighborhoods and emphasized community involvement. Rather than just shoveling news articles from the paper online, many newspapers have struck gold by creating local portals as guides to their locales, including entertainment listings, restaurant reviews and directories of local businesses. They can start by listing everything in the town for free online, and then enticing businesses to buy premium listings, graphical ads and other add-ons. These portals can live off of the newspaper site or within it. One successful local portal is Vegas.com, which has helped financially support the advertising-free print newspaper, the Las Vegas Sun. The Sun recently hired top new media guns Rob Curley and Chris Jennewein. Prognosis: The more comprehensive these online portals are, the better. In order to boost traffic (and ad rates), these portals need to become the trusted source of listings in a community — outstripping Yellow Pages and alternative weeklies. Many newspaper sites have been highlighting audio podcasts and video reports from staffers. It’s a great way to use the power of the Internet, and also a way to bring in new types of online advertising. Despite the deep recession, eMarketer still predicts that online video-ad spend will increase in the U.S. by 45% to hit $850 million in 2009. Many newspaper publishers would like to capture some of that income, but they need to make sure the video ads aren’t too intrusive and that video content is worthwhile for viewers. Currently, many video reports on NYTimes.com are preceded by 15-second video spots, half as long as ads you’d see on TV. Prognosis: Still dominated by a mix of generic wire service and poor quality videos by local reporters at most papers. Big papers like NYTimes.com, Washingtonpost.com and WSJ.com have led the way in monetizing and producing high quality original video reports. In print, newspapers have tried to cater to specific readers by adding specialty sections like technology, food, wine and religion. But online, newspapers can get down into much more specific niches — and they are not limited by print holes in how many they can run. That has led to a proliferation of sites for moms, who provide the content with their own blogs and forums, and are filled with ads for diapers, kids’ clothing and retail outlets. The Wall Street Journal, however, pointed out that sites like BabyCenter are now among newspapers’ competitors online. Prognosis: Niche sites can bring a new audience to newspapers online, reaching out to people who normally wouldn’t buy a print paper. As long as they can stay fresh, involve the community, and stay focused on their niches, these sites can help bring in new advertisers for newspapers as well. There is a long tradition of newspapers being run as non-profit organizations, with the most prominent being the St. Petersburg Times run by Poynter. But online, there has been an even greater push to support original local journalism with a combination of foundation grants, reader donations and online sponsorships. This model has been used by NPR and PBS for decades, and is now being tried by startup sites such as MinnPost and VoiceofSanDiego, which were profiled recently by the New York Times. Plus, the patronage model has helped start the investigative journalism site, ProPublica, staffed by many former newspaper editors and reporters. Prognosis: While it’s difficult to imagine all journalists being supported by billionaire philanthropists, many of these startups have been able to survive and thrive thanks to foundation funding and donations. The Knight Foundation recently pumped nearly $400,000 into four of these startups. Full Disclosure: The Knight Foundation is also a funder of MediaShift. Charging for content has perhaps been the most challenging monetization strategy for online newspapers . While some newspapers initially charged for access to all of their news articles online, most of those pay walls have been dropped. The New York Times started a TimesSelect product to charge for Op-Ed columnists and other features, while the Los Angeles Times tried to charge for its CalendarLive site. Both publications gave up on those paid content initiatives. Still, most newspaper sites continue to charge for archives and other premium content in an attempt to diversify their revenue streams online. Prognosis: People want everything for free online, but in some cases, they will pay for very specialized information that they can’t get anywhere else. When Rupert Murdoch took over the Wall Street Journal, he had hoped to bring down the pay wall, only to realize just how profitable it was. Some pay walls will work. This list is only the beginning. Let us know about other business models we missed, or if there are other examples of publications that are using these models in unique ways. We will update this story with your submissions, and give you credit and a link. Just let us know through the comments below, or by using the Contact Us form on the site. Additional research for this story by associate editor Mike-Rosen Molina. Good point, Kenneth, in that I failed to mention alt weeklies and their own models online. How do their online business models differ from the daily newspapers’ efforts, and can you share which ones have been most successful? What we need now is a bailout for newspapers. Not a blank check to soften the cushion for the likes of Sam Zell. No, let’s help newspaper journalism survive because it is vital to the Republic. But, only those newspaper companies that can develop a workable plan to quickly transport themselves into the digital age should be eligible for this bailout. The money should strictly go toward helping newspapers to stop killing trees and become Internet-centric. Newspapers – or at least newspaper reporters and editors – are critical to our society and democracy. If newspapers start collapsing and closing down, we will lose a public service that’s more valuable than many branches of government. And, while banks and auto manufacturers may be vital to the economy, newspaper journalism is vital to the democracy. There will be almost nobody to keep government, industry and other special interests honest without newspaper reporters. TV and radio reporters only tell you briefly what happened. Bloggers (like me) tell you what they think happened, often with no facts to back it up. Newspaper reporters and editors tell you what happened in detail, why it happened and what it all means. Only in newspaper journalism does the public get enough information to decide the truth for themselves. TV, radio and blogs still get most of their information from newspaper reporters. Unfortunately, people who work at newspapers have been deluding themselves over the past ten years that they could somehow survive in the dead tree business. But the avalanche of bad news cannot be denied. Many newspapers, the way they’re currently run, may have only a few years to live. Newspapers can survive, but only if they race as fast as possible to the paperless future. They won’t do it on their own; they need some enticement or coercion. A bailout of newspapers won’t cost anywhere near what it costs to bail out Detroit or Citibank. And if the government wants some equity stake as collateral, I’m fine with that. It works with NPR and BBC. If newspapers can come up with a plan to go wholly digital, taxpayers who love democracy should help them out. Newspapers have certainly bailed out taxpayers often enough. 1. Make all their news group-readable, so you can start a dialogue with whoever is writing a story and develop additional stories, blog posts, etc., perhaps with the help of the reporter. 2. Use their editorial staff as a guide for all that’s going on in the city. Instead of having just food critics write restaurant reviews, turn the entire staff into food critics, posting a short review every time they go out to eat. The site would very quickly collect much more content than sites like Yelp (which relies on unpaid reviewers) and raise the profile of the paper. To Jim’s point: I don’t support a bailout for newspapers for the same reasons I wouldn’t support one for automakers: There’s precious little evidence that the industries know how to save themselves. Notice the plural — there are two separate industries at work here, even though we’ve generally treated them as one for reasons that, while sound in the past, are increasingly irrelevant. First, there’s the journalism industry — the work of reporting news. It is, as Jim notes, crucially important in a democracy; what it is *not* (and perhaps has never been) is sustainably priced (that’s different from “rationally priced”) in the market as a standalone product. Lots of causes for this, ranging from the way most journalists pursue their jobs (i.e. a sort of avocation/priesthood rather than business model) to the institutional animosity between revenue production and content creation at most large newspapers. For the business of journalism to make the jump into the future, it needs to figure out how to get paid without necessarily shackling itself to a big sales infrastructure interested in selling, you know, something other than journalism. The other industry is the business of newspapering, which can be considered wholly apart from the business/avocation of journalism. This industry relied on scarcity of bandwidth (real and technological), high costs for business entry and, over time, local/regional monopolies. It was, if you look at the historic returns of the big newspaper publishers, a great business to be in. For this business to make the jump, owners need to figure out how to make money (wait for it)… without journalists. Not because they are unnecessary, but because the audience has turned into a bunch of vertical and horizontal segments and many of them don’t need journalism as their primary content. Of course, there are other challenges too and merely getting rid of all the journalists is a bit of a straw man — but it’s a good straw man in that it strikes at the heart of the monolithic, our-content-or-the-highway model. Thanks for the thorough review of what is currently out there for business models. All of these seem pretty “product” focused, done “for or to” customers. We are trying to create a Complete Community Connection, along the lines of the Local Information Utility outlined by American Press Institute, where the network of local information, created “with and by” the multiple communities we serve, is the trusted source of local information. We’ve looked at many of the alternatives newspapers have tried. This is as good an overview as I’ve seen. Here are my comments on what’s presented here. It’s not surprising that the inhouse stuff is doing better. The problem is not enough traffic, which come from the lack of compelling editorial. Good, compelling writing is hard work and takes talent, too. And copywriting. There are exceptions, but much of what newspaper blogs are posting is dreck. This is very tough. The only option here is to specialize into high margin audiences, such as classified ads for lawyers or doctors or dentists, or horse owners or parents of special needs children, perhaps working with professional groups who never can quite get it together. These types of high-tech print products can be fun to do to get attention, but because of the cost they are seldom sustainable. This holds more potential than many think. The primary problem is, like the blogs, the real need is for compelling content, which isn’t easy to find. The suburbs are boring. It’s difficult to find worthwhile photos. But, just one good writer/editor and some ad support from a few retailers can create a worthwhile base. Publishers can then start a network of hyper-local web sites and papers. Newspapers have the local brand, but they can’t take the reader for granted. It’s got to be quality. The problem with portals is there are too many of them locally because the bar to entry is so low. Then there is the problem of working where you’re mostly providing free content for Google. The profitable ones build traffic by offer a point-of-view with some of their listings. Not the typical news approach, but newspapers know how to do this. This shouldn’t be listed here. Video is going to be key, but the discussion here is where and how video will be deployed. In blogs, in special web sites, in hyper-local products, etc. Video is not going to produce an audience. You first find and develop an audience, then exploit it with video. Good analysis here. The potential of niche sites is strong. Newspapers have the brand that can add real value to niche sites and can create a network with enough of them. The power of the newspaper brand is why, for example, Wuduplz.com is partnering with local publishers. Wuduplz allows them to sell the ads around the cute little text messaging service for parents. It’s a win-win. I agree with Glaser. There is not enough non-profit money to do the job that needs to be done. Eventually, more pay walls will go up. Another good example, besides WSJ, is the success of HBO on cable TV. Still, mass media is about high numbers. Or, at least high-enough numbers. Local publishers have to fret about direct mail, billboards, radio and the guys in sandwich boards on the highway. This is like herding cats. It’s tough for newspapers to be part of this, from what I have seen. But, they can be useful in promoting local channels such as niche sites. Good analysis, except it seems to me that you are mixing business models for journalism with business models for newspapers. While I agree the two are inextricably linked now, the future of professional journalism may not be so dependent on newspapers. 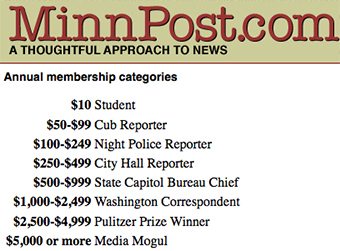 MinnPost and ProPublica are solutions for saving journalism, but are, in fact, creating competition for newspapers. On the other hand, local portal newspaper sites often cut into journalism (or at least investigative journalism as we in the profession have come to know it). That’s not to say that there isn’t room, or even profit, for all of these things. The trick is to find ways to support and pay for journalism careers. “Crowd Funding” is a good example of how that can be done, even if some or all of newspapers go by the boards. What all of this means is that our definition and vision for journalism must change, including some of what I call the “High Tenets” of the profession. We need to stop clinging to our time-honored elite notions of what constitutes journalism and return to basic storytelling and delivering reliable and usable information. I’ve developed a service that I believe can add value to the newspaper industry. It was not my intention in the beginning, but it now seems to be a viable solution. I already have one newspaper chain investigating the opportunity at this time. For advertisers, it all boils down to value. 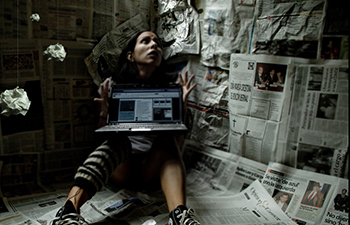 It seems technology has fragmented the media landscape to a point where the impact is far less than is used to be. For newspaper advertising to remain relevant, it may need to leverage other services to remain a viable option for business. I’ve developed an affordable, highly effective service to help business owners get the best results from their business. My service makes it easy and convenient for business owners and customers to communicate with each other, resulting in higher growth and profitability. So where’s the opportunity? My service also allows business owners (through their own contral panel), the ability to respond to customers directly, ask questions, and post special offers. They can also reward customers that leave contact information with incentives. The benefit to business is: one, the ability to leverage their newspaper ad by pointing to an online special that can be changed everyday, two, the ability to receive “confidential” comments from consumers, and three, the ability to respond to consumers. The benefit to the newspaper is: one, a value added service, two, a new revenue stream based on a recurring monthly membership fee, and three, a new way to increase their presence online. There’s more, but enough said for now. I’m looking for opportunities to take my service and the concept I’ve created to the next level. Any suggestions would be greatly appreciated. I was in Moldova last week, where a website succeeded in making people *pay* to blog under their brand. Having a blog under a .unimedia.md address is costly and you have to be approved by the editorial team (ie not eveyone can blog there). In other words, your newspaper can monetize its brand and its traffic to would-be bloggers. Thank you Nicolas. Finally someone mentioned that the world is round and much bigger than the USA. In many areas (such as Asia, for example, Rusia or Eastern Europe) newspapers and magazines do relatively well. They are less ad-dependent, and in many cases their online versions are available for a fee, through various forms of micropayments and mobile-payments. I would suggest then that the US press should take a second look at micropayments and perhaps also getting a bit more global to off-set their US- and ad-based losses. About the paid-for blogs, and in a very down-to-earth way, I’m sure there are a few hundreds dollars to be made by selling branded blogs. Take the Atlantic Monthly, for instance. They only have 9 blogs. How much would someone be ready to pay to have its own .theatlantic.com blog? Adding a vetting process to that would be useful, so as to increase the feeling of elite-ness in the paying blogger’s mind. A system where you pay for a spot on the homepage would bring some additional cash, too (LiveJournal does that in Russia). Today, there is no workable answer. Can anyone show me a Web site of a major newspaper that supports itself? Just saw an article that the NY Times site gets something like 173 million unique visits a month, but actually needs over 2 billion a month to break even. Will that ever happen? Doubt it. I agree with Jim’s point about bailing out newspapers. In my view, it would be a tragedy to lose real newspapers and their writers and news-gathering organizations. Sorry bloggers, but 99.9% of you don’t even come close. And if major media ever got off the Web, most bloggers wouldn’t have anything to quote. And as for all the suggestions that current reporters should basically be blogging 24/7 (every one a restaurant reviewer), give me a break. I love how people suggest jobs for others that they would never ever do themselves. I don’t think we have an answer yet. Micro-payments maybe. Or be threatened with a real loss of information and one of the basic tenets of a working democracy. I’d like to take a moment to introduce you and your readers to a free service that could prove to be a significant enabler of these and other alternative business models. It’s not the answer – but it is a building block. Calais is an initiative by Thomson Reuters. Our homepage is located at http://www.opencalais.com and can provide you with more detailed information if you are interested. Calais is a web-based service that can take your stories and blog postings and automatically annotate them with rich semantic metadata. It can find entities (such as people, companies, organizations, geographies, etc), facts (“John Doe” is the “CEO” of “Acme Corp”, etc) and events (A Natural Disaster of type “Landslide” occurred at place “Los Angeles” at time “04:22”). You send your text; Calais analyzes it and returns the annotations. It takes about 0.5 seconds to complete and you can use it 40,000 times per day for free. It’s very simple to integrate with your existing systems withy only small programming investments. You can improve the searchability of your content. By adding the appropriate annotations within your CMS and as metadata within your pages your readers and search engines will do a better job finding your content. You can annotate your news archives in a matter of hours. By tagging archives you improve search and perhaps drive additional value from archived content. You can use it as a starting point to build topic hubs with significantly less editorial overhead than a manual approach. For example – a business page on acquisitions in your geography could be built in a 100% automated fashion. You can the annotations to improve advertising placement and performance. By annotating the page with the concepts on the page (sports, natural disaster, management change, etc) your keyword-driven ad placements now become keyword + concept drive ad placements. To get a quick feel for the performance of Calais simply copy the text of one of your articles, go to sws.clearforest.com/calaisviewer/ paste it and see what it finds. I just completed a 10-page paper on the future of journalism (specifically the survival of newspapers) and your blog captures the essence of the business models I researched, but you do it so succinctly. Nice job! Thanks for posting this list. It’s an important time in history for a struggling industry and for us journalists caught in it all. The number one reason I don’t buy or read newspapers anyone (I’m 46 yo btw) is that they all lie to my face on basic facts and analysis, they do not filter, synthesize or analyze anything they print, they have in short become little more than propaganda channels for business and government and no longer perform their original function as the 4th Estate. I understand many of the forces that have created this and I’ve seen them before in other industries. From what I know (and have seen empirically) from organizational behavior, I’m doubting that the very structure of the news paper is viable. Just as the big Fortune 500 companies are no longer viable at producing quality at a profit, it may be that it is not longer possible to produce a full featured, blot-out-the-sun newspaper with quality at a profit. Blogs are one way to separate the monolith. There are what I rely on these days with a sprinkling of MSM news sites as contrast and a lot more foreign news for sanity checking. It’s like the days of shortwave radio listening. There may be other ways other than blogs. Some probably wont’ work well without new technologies like E-paper. The key function of analysis and synthesize is absolutely mandatory for success. It may require something different like interaction or exploration. I don’t think that simply “filtering” on preconceived interests or ideologies is useful – you can already get that from blogs. Electronic tools to help interactively explore and discover truth: not flash presentations – this are just broadcast cartoons and not interaction. Unless the original value with new augmentation can be captured, sadly I’d say newspapers are over as a business model. I don’t think that Newspapers will disappear within the next yeards, but a good newspaper has to build up a good online strategy, too! I own some Weblogs and internet portals: http://www.rebenland.at where we have our own “online paper” for a specific region within Austria. 1. Compelling content – Local advertisers typically take a print ad and try to repurpose it as a display ad online. Ugly…and nobody clicks on it. 2. Learning Curve for Local Advertiser –They understand the traditional print products, but glaze over when you talk about CPM/CPC. Number 1 complaint “Why don’t I see my ad”…they bought 1000 impressions on a site which delivers 2 million impressions per day. 3. Sales Rep Understanding – Sales reps can be equally as clueless about the online world. Many have sold print for 20+ years, and aren’t computer savvy. 4. Hyper Local Targeting – Starbucks spends big bucks to have a national advertising campaign…but a local coffee shop might value 3 block radius of their store higher. Hyper-local ability puts local advertisers on a level playing field with national advertisers. 5. Model – CPM advertising really doesn’t seem to work for a small advertiser. It needs to be a pay for performance. News may not be paper based in the future but people will always want something to carry, hold and read while waiting for a bus. Your post reminds me of the allegory of the blind men and the elephant. The problem is that the original source of a daily newspaper’s strength was that it was the definitive place where one could go to get the news that mattered. One could go directly to their favorite sections, then deep dive. One of the challenges with creating an alternative business model for newspapers is that for decades newspapers have been an amalgam of businesses: part classifieds, part display ads, part yellow pages, part customer publisher, part list broker. And, in turn, newspapers rely on a complex mix of wires, freelancers, stringers, and so on. In comparison, alt weeklies rely on a steady stream of weekly entertainment-related advertising with a smidgen of classifieds. If you’ve seen the “newsroom” of the National Enquirer you’d probably agree that alt weeklies have more in common with tabloids than they do with a daily newsgathering operation. In my view, newspapers need to co-opt some of the functionality that ProfNet and then HARO have used to build their businesses. This functionality is required for the newspaper to retain its position as the definitive, most authoritative source of information on local topics. When they have reached that level of authority, only then will they be in a position of strength to deal with Google and other information based businesses. Over 20 years ago there was a report by investment banking firm Hambrecht and Quist on “information vending” companies and what made them successful. The findings then were remarkably prescient. Companies that either had a proprietary source of data acquisition or distribution were in a position to succeed. If you look at any successful Web business, from Amazon to Zillow, you see Joseph Laird’s findings come to life. I have to agree with Andy Strote: I haven’t seen anything here that shows that the newspaper industry could be saved. Upon that, many people who are posting their views are showcasing their own sites to prove a point. But most of these sites aren’t the answer. Even Strote said that if the industry dies on the top ( reporting ) than no one at the bottom ( bloggers, Op-eders, news aggregation ) will have anything to write. Spot.Us seems good, but even then I have to question where the story will get published, and if the writer owns his “space” or paper, does he gain extra money from advertising? The double-dipping prospect, or the prospect of non-transparency, makes me hesitate on community-oriented programs without clear guidelines. I think we have reached a point where reporting has become too expensive, and the operations must be lessened ( cutting workforce, increasing tech use ) or the reporting must be made of better value ( ie: pay cuts ) that will help the industry survive. These alternative methods aren’t really much because they have been around for years. I congratulate the writer for doing his homework. At the same time, I don’t see how these methods will save no more than a handful of big newspapers. Brian Hayashi is also on point, but I think one can also succeed with an ability to brand ( AOL has always been lagging behind in multiple industries, and has somehow survived because they put their name on something first ). I live in Malaysia, and I am the CEO of Malaysiakini.com, a fully online news only website. We charge US$40 per year and we have about 12,000 active paying subscribers plus a further 200,000 unique daily readers who read the free stuff. You can google Malaysiakini for lots more information about us. It has been fairly obvious that since the invention of search and aggregation, media owners have lost their hold on advertising and are unlikely to come up with an ad supported model that can cover costs of journalism in its current form. Media can survive, but journalism needs to save itself from extinction. Hometowntimes.com has solved the local online news model by providing a franchise opportunity with a proven, proprietary content and ad management system that delivers a home/community based business opportunity to journalists, advertising salespersons, reporters, and local writers. We believe that the local market has its unique characteristics, issues of concern, and lifestyle that can only be reflected by ownership and by someone living in the community. Hometowntimes.com presents a proven business model to support such delivery of hyper-local news, information, events, and services. nobosh.com only takes the news that NEWSPAPERS are reporting and put it on their website. Where are they going to get that information if there are not any more newspapers to steal from? I’m not sure how Hometowntimes.com plans to make money. If newspapers are struggling to to get advertising dollars from local sources and struggling to pay their news staff, how does this website plan to make any money? My guess is the website will get the franchise money and thats how they make money but what about the guy that buys the franchise? The VALUE of Print Newspapers in our daily lives. The main purpose of the print newspaper as a “PILLAR OF FREEDOM” is to provide all citizens of all ages, slowness or quickness of mind whether they are looking for the information or not to use their gift of understanding from their point of view in life to choose a path to proceed in their Life’s quest for peace, happiness & security from all harm. Television News provides sound bites and for some it is too quick to see the truth beyond the veil of neglect, greed or indifference of possible biased reporting. Internet News? Is it a blessing or a curse? We thought nuclear energy was going to be a blessing until it was acquired by nations with questionable motives. Knowledge it seems always gives us a good side and a bad side that is sometimes worse than the good side. Internet News instead of providing a smorgasbord or variety of news for some of us to ponder over with a cup of coffee for its meaning, it gives us items of interest that we can bring up to suit our taste. Some of us do not like bad or terrible news where people suffer and will not take time to search for it. To understand the gift of “Free Will” one must at least know the extreme limits that some will pursue whether it is going to the moon or stealing from a bank. Newspaper investigating reporting helps to discern the truth about change in the good or bad aspects of our community life. In our quest in life, trial and tribulations will happen. I remember back in the 50’s when DDT was sprayed over our area, what a blessing to get rid of the flies until the book “Silent Spring” made us realize the truth. Birds were vanishing. The herbicides farmers applied to crops to prevent weeds damaged shrimp beds for seven miles at the mouth of the Mississippi River in the gulf. I did not go looking for the above but I happen to see it in a newspaper. Out of the group, I think my vote is for niche sites. I’ve found that in my 5 years of SEO consulting experience, getting brand new websites to rank for niche-related keywords is extremely easy if you have the right domain URL. However, this is not to say that I discredit any of the other mediums you mentioned. They all serve their respective purposes and are all powerful in their own ways. Great write up Mark! Do you need a Money?